Dear Miss Breed won the National Council for the Social Studies Carter G. Woodson Book Award for 2007 and was chosen for the New York Public Library's Books for the Teen Age 2007. Japanese Americans incarcerated during WWII, and a librarian who made a difference to these children. are the inserts from letters of Miss Breed to "my children." children were amazing; they started libraries in the camps with as few as 10 books. We could go on and on, but our recommendation is to read this 288-pager. It's a great read-aloud we think you'll enjoy as much as the children will. When Japanese Americans in San Diego were being shipped off to incarceration centers during World War II, Clara Breed, the children's librarian at San Diego Public Library, went down to the train station and distributed stamped, self-addressed postcards to many of the children and teens she knew from her work. She asked them to write and tell her how they were doing, and they did. Over the course of the next two-and-a-half years, a number of them kept her informed about their lives, first at the Santa Anita racetrack, where many families were given a small space in the stables that still reeked of horse urine, and then at Poston, the “internment” camp where most of them ended up--built in the middle of the Arizona desert. She wrote them too, and although only one of those letters survives, it is clear from their correspondence to her that her many letters and cards, Christmas gifts and care packages, and books-many, many books--helped them know, just as she had intended, that they were not forgotten. *STAR* Oppenheim, Joanne. Dear Miss Breed: True Stories of the Japanese American Incarceration during World War II and a Librarian Who Made a Difference. Feb. 2006. 288p. illus. index. Scholastic Nonfiction, $22.99 (0-439-56992-3). 940.53. 5Q ( Hard to imagine it being better written) . 3P . M . J .S Oppenheim, Joanne. 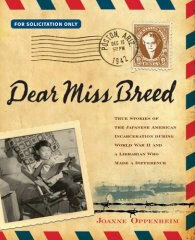 Dear Miss Breed: True Stories of the Japanese American Incarceration During World War II and a Librarian Who Made a Difference, Scholastic.2006.288p. $22.99. 0-439-56992-3.. Index. Illus. Photos. Maps. Biblio. Notes. Appendix. In his last year, this reviewer's father, a Pearl Harbor vet, spent time in a daycare program for dementia victims. Routinely he would return home to recount stories of a fellow daycare resident, a Japanese American woman who had spent time at Manzanar. Her memories are unforgettable, much like the letters and interviews in veteran author Oppenheim's nonfiction recounting relationships between a special librarian and her incarcerated young readers. Clara E. Breed, children's librarian for the San Diego Public Library, celebrated all young readers, and her commitment did not end when Japanese families in the area were torn from their homes and lives following December 7,1941. Oppenheim collects scores of communications back and forth between Breed and her readers, making inferences, interpreting contexts insightfully. Notes reveal gifts that Breed sent students, along with shopping lists they sent her with money orders. Anger, bitterness, and sadness fill correspondence from older students, aware of injustices forced upon them. Younger readers adapted more readily to condition at various camps. The volume includes historical sidebars, photographs of letter writers (as children and adults), and rare internment camp pictures. Although some nonfiction written for students is superficial, assuming research versus evidencing it, this book is thoroughly, clearly documented, including chapter notes, acknowledgements, and bibliography. Additional highlights include follow-ups on the children and a reunion gathering. Fortunate social studies students will find themselves immersed in this engaging and poignant personal history, demonstrating that a single person can, indeed make a significant difference in the lives of many. Memorable? Absolutely.- Parri Sylvester Spencer. The book is lengthy...but compelling, as well as eerily timely in light of current debates about civil rights. The story of this long, ugly episode has not before been so fully told for young people and deserves wide reading and discussion. "Joanne Oppenheim's Dear Miss Breed is the moving story of the San Diego librarian who stuck by "her children" as theylived through the terrible history of the incarceration of Japanese Americans. Because she tells the story mainly through the actual words in letters from "her children" in camp, it brings to life--more than almost anything else I've seen in print--that experience, so long lost in the bin of bitter memories or layered between or beneath the bittersweet recollections of growing up, even in the desolate desert camp to which they were banished." "Dear Miss Breed tells the story of a tragic event in modern American history, the wartime incarceration of Japanese Americans, through the eyes and words of the children who were its most notable victims. A bittersweet valentine to the power of the democratic spirit, it celebrates both the courage of the young Americans who struggled to build a normal life amid the unjust imprisonment and harsh conditions of the camps, and that of the unassuming San Diego librarian who was their champion. Dear Miss Breed not only adds to the long tradition of children's literature on the Japanese American incarceration, but provides new material for historians." Although most other Californians applauded the decision to exile Japanese Americans in 1942, a few were appalled, and a very few did something about it. In a sensitive and fascinating new book, Joanne Oppenheim tells the story of Clara Breed, a San Diego librarian who went to the train station from which Japanese San Diegans were sent to the concentration camp at the Santa Anita racetrack and handed out postcards asking children to write her from camp and she would send them books. This unique event has previously been described but Oppenheim has turned it into a wonderful book which gives a gripping account of what the evacuated people went through. She also tells Clara Breed's life story, prints many of the letters sent to her, and has tracked down and interviewed many of Miss Breed's surviving correspondents, and gets their side of Miss Breed's story. In one of Breed's 1942 letters she wrote that "I have moments of being afraid of America." For those of us who have similar moments today, this book will be both a kind of comfort and a challenge." "Dear Miss Breed is the product of a remarkable collaboration between two exceedingly creative and compassionate women who never met yet lived out their shared conviction that good books possess the power to sharpen young people's sensitivity and promote social justice. Children's librarian Clara Breed forged a special bond with her youthful San Diego, California, Japanese American patrons in the years before Pearl Harbor, which she then strengthened during their ethnic community's unwarranted detention in World War II federal prison camps via a steady stream of heartening letters and judiciously chosen books. Now, over a half-century later, acclaimed children's books' author Joanne Oppenheim has drawn information and inspiration from Clara Breed's preserved cache of palpable reply letters sent by her young correspondents to craft an amazing book that illuminates a bleak chapter in American history and dramatizes the vital if unheralded role played by librarians in safeguarding not merely our books, but also our civil and human rights." Arthur Hansen, Professor Emeritus of History and Asian American Studies, California State University, Fullerton, editor of Japanese American World War II Evacuation Oral History Project (K. G. Saur, 1992-95). As tens of thousands of Japanese Americans were shipped off to incarceration in World War II, Clara Breed, a librarian in San Diego, understood the simple power of a book to fight oppression. She spent the war years sending books to Japanese American children behind barbed wire. With "Dear Miss Breed," the book you hold in your hands, Joanne Oppenheim carries on in that noble tradition. The book vividly and movingly documents the entire sorry episode we call the Japanese American internment, bringing the reader up close to the real human lives that were affected by it, particularly the lives of children and teenagers. Its tone and level of sophistication make it appropriate for a broad range of readers, from middle-schoolers to high-schoolers and even adults. The book joins "Farewell to Manzanar" and "Baseball Saved Us" among the essential works on the Japanese American internment for young audiences. "What a wonderful gift Joanne Oppenheim has given us with this book, a story that honors librarians and humanizes a shameful time in our country's history. Through gripping first-hand accounts and dogged archival research, Oppenheim tells the extraordinary story of librarian Miss Clara Breed and the difference she made to Japanese-American children and their families who were stripped of their rights as American citizens, forced from their homes, and housed in substandard internment camps in the aftermath of the Pearl Harbor bombing. Thank you, Joanne Oppenheim! Long live librarians like Miss Clara Breed!" Susan Campbell Bartoletti, award-winning author of Growing Up in Coal Country, Black Potatoes: The Story of the Great Irish Famine, and Hitler Youth: Growing Up in Hitler's Shadow.